GTF refers to Glucose Tolerance Factor. Its function in the body is to facilitate the cellular action of insulin and also to support the efficient uptake of glucose for energy. 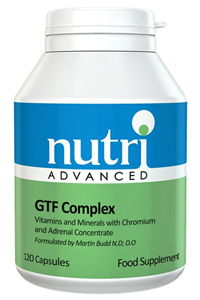 Nutri Advanced GTF Complex also contains B vitamins which play a role in all aspects of energy production and glucose metabolism. 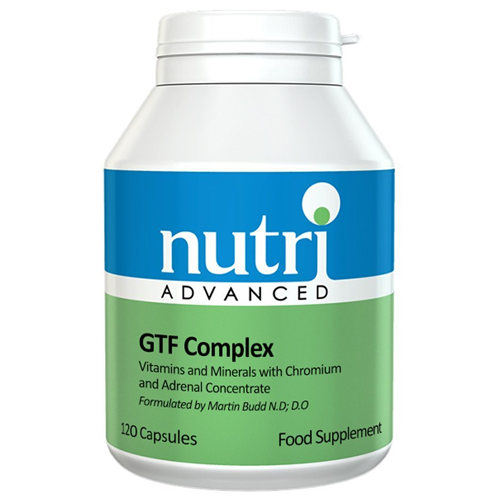 The Vitamin E in GTF Complex provides antioxidant support while Chromium is part of the GTF. Zinc is also included in Nutri Advanced GTF Complex to help support pyruvate levels for energy production. GTF Complex is formulated by well known naturopath Martin Budd, N.D.
1-2 capsules three times daily, or as directed. Not recommended during pregnancy or whilst breastfeeding. Not recommended for children under 12 years of age unless directed by a health care professional.